Forward from J. Arnoldski: The Alternative for Germany party has relatively recently entered the infosphere’s headlines as the “pro-Russian party of Germany,” the leading example of “Euroscepticism,” or the poster child of the rise of the “European ultra-right” as a reaction to the crisis of Atlanticism in the European Union. Despite the haste with which labels are applied to the party, few serious English-language publications that objectively present the party’s history, positions, and trajectory exist. In this monograph written exclusively for Fort Russ by the Russian specialist on German politics, Vyacheslav Shcherbakov, precisely such is laid out for the uninformed but curious reader to draw independent conclusions. As this party and others like it in Europe continue to rise in reaction to the EU’s failing Atlanticist policies, it will certainly become an entity more frequently visited in the information war and critical political analyses. The following two-part piece by Dr. Scherbakov presents itself as an objective, informative introduction to the topic. Alternative for Germany: The Genesis of a New “People’s Party”? The topic of rejecting the euro is nothing new or original for Germany. Starting with the late 1990’s, various politicians and parties, by and large of the right-populist bent, fought first against the introduction of a single European currency, and then for abandoning it. It is sufficient to recall the odious entrepreneurial figure Bolko Hoffmann and his party “For the German Mark”  or the Hamburg politician Ronald Schill . Then, however, there appeals did not find such broad understanding across society. The Germans quickly got used to the euro and learned to value it. It would seem that the proposal to reject a single European currency finally became just another propagandistic posture among a narrow circle of radical right marginals. The economic crisis towards the end of the first decade of the 2000’s, however, severely aggravated the distrust towards the euro among a considerable part of German society. Critical statements against the common European currency were heard all the louder not only from the “center-right” camp, but also among rather respectable politicians and economists previously unassociated with right-populist sentiments. In 2010, according to a survey conducted by Der Spiegel, more than a third of Germans considered returning to the German mark necessary. At the same time, the publication emphasized that 49%  of people among the less-educated segments of the population were against the euro. An ever-increasing number of Germans wishing to return to the mark has significantly surpassed the total capacity of traditional radical right organizations. Meanwhile, not a single one of the parties claiming seats in the Bundestag showed any signs of rejecting European integration policy, the most important component of which was a single European currency. Such sentiments put before society the real likelihood of right-wing radicals strengthening their positions by virtue of having long since exploited the topic of returning to the German mark. One event which somewhat alleviated the situation was the founding of a new party without the participation of traditional “center-right” forces and figures. 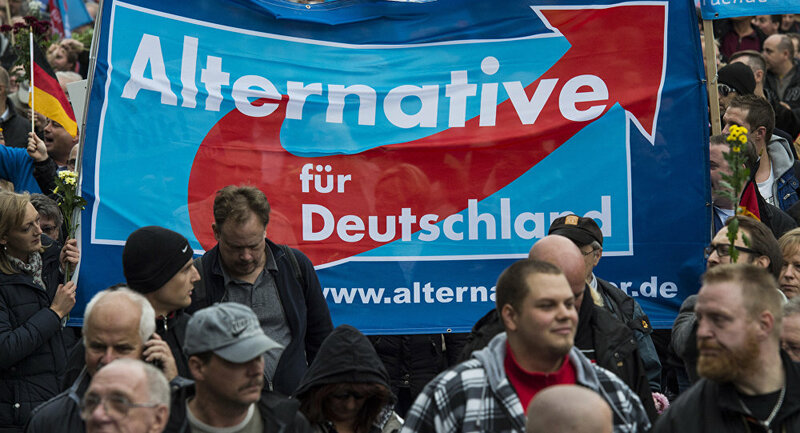 On April 14th, 2013, the founding assembly of the new Alternative for Germany party was held. Although the “return to the German mark” theme was undoubtedly essential, the program’s developers sought to defend themselves from accusations of forming a “single issue party.” Therefore, they touched on a number of problems that, in their opinion, are troubling society. They included demands for a commitment to “A Europe of sovereign states” with a common internal market, demands for EU reform, and the “liquidation of the Brussels bureaucracy,” the strengthening of the democratic freedoms of citizens, and introducing a system of popular referendums along the Swiss model. The party also spoke out in support of families and especially pensioners and children: “Family solidarity support is an investment in our common future and an important part of inter-generational consensus.” An important component of such family support was determined to be an educational system including kindergartens, schools, and universities. At the same time, parents are to be responsible for the education and upbringing of their children and should be supported by the state. The situation with integrating immigrants had led to such programs so valued by AfG to be shut down. In a rather short section, special attention is devoted to the necessity of revising immigration laws. The immigration system of Canada is presented as one to be imitated: “It is necessary to put an end to indiscriminate immigration into our social system.” On the same note, it is emphasized that persons persecuted on political grounds should be given priority right to asylum in Germany. In Bundestag elections on September 22nd, 2013, Alternative for Germany won 4.7% of secondary votes. In order to gain a seat in parliament, the young party needed merely .3%. When it seemed like the history of the Eurosceptics’ party had concluded, it was in fact just getting started. Within only several months following elections, AfG’s Bundestag rating rose to and hovered at the 5-6% level. On March 22nd, 2014, an AfG congress adopted a program for elections to the European Parliament under the slogan “Courage to Stand Up for Germany. For European Diversity.” Exiting the Eurozone and transforming the European Union continued to be the main points. In elections to the European Parliament on May 25th, 2014, Alternative for Germany received 7.1% of the vote. This catapulted the young party to an entirely new political level at which they had to be considered “political heavyweights.” The German press called AfG “the main winner in the 2014 elections to the European Parliament,” as more than 900,000 voters who previously voted for the established parties gave their vote to the Eurosceptics. The Alternative for Germany camp was joined by not only 510,000 CDU/CSU voters, but also more than 100,000 from among the Left’s electorate. Yet another major breakthrough for the young party were the elections to regional parliaments in the two East German lands of Thuringia and Brandenburg. In the preamble of AfG’s electoral program for the Thuringia Landtag, “A Breakthrough for Thuringia,” it was stressed: “Our heart belongs to a ‘Europe of fatherlands,’ which should consist of sovereign democratic states independently representing the economic and political interests of their peoples.” The drafters of the program identified themselves first and foremost as Thuringians, then as Germans and, finally, as Europeans. The program’s section concerning immigration was consistent with previously adopted documents. However, the accent of attention was put on the necessity of putting migration-related issues up to referendum. The demand was expressed for the strict implementation of immigration and asylum laws, the latter of which should serve to defend people persecuted for political reasons, and not simply facilitate migration. In addition, the need to “stop the abuse of double citizenship” was emphasized. Современный правый популизм в ФРГ: партия Рональда Шилля // Проблемы истории России и зарубежных стран. Материалы XV Международной научной конференции историков 14-16 апреля 2010 г. Владимир, 2010. с. 186-202. Umfrage:Deutsche wollen Euro behalten[Электронный ресурс] http://www.spiegel.de/wirtschaft/umfrage-deutsche-wollen-euro-behalten-a-733874.html(дата обращения:1.07.2016). AfD gegen «Verletzung demokratischer Grundsatze»[Электронный ресурс] http://www.zeit.de/politik/deutschland/2013-04/parteitag-alternative-deutschland(дата обращения:1.07.2016). Wahlprogramm. Parteitagsbeschluss vom 14.04.2013. S.1. [Электронный ресурс] https://www.abgeordnetenwatch.de/sites/abgeordnetenwatch.de/files/afd_1.pdf (дата обращения:15.07.2016). Wahlprogramm. Parteitagsbeschluss vom 14.04.2013. S.4. [Электронный ресурс] https://www.abgeordnetenwatch.de/sites/abgeordnetenwatch.de/files/afd_1.pdf (дата обращения:15.07.2016). Endgultiges Ergebnis der Bundestagswahl 2013. [Электронный ресурс] https://www.bundeswahlleiter.de/de/bundestagswahlen/BTW_BUND_13/ergebnisse/bundesergebnisse/index.html (дата обращения:15.07.2016). Wahlumfragen fur die Bundestagswahl in Deutschland. [Электронный ресурс] http://www.wahlumfragen.org/bundestagswahl/wahlumfragen_bundestagswahl.php (дата обращения:15.07.2016). Mut zu Deutschland. Fur ein Europa der Vielfalt. [Электронный ресурс] http://afd-basche.de/images/PDF-Dateien/Europaprogramm-der-AfD.pdf(дата обращения:15.07.2016). Endgultiges Ergebnis der Europawahl 2014. [Электронный ресурс] https://www.bundeswahlleiter.de/de/europawahlen/EU_BUND_14/ergebnisse/bundesergebnisse/ (дата обращения:15.07.2016). Wo kaum einer zur Wahl ging [Электронный ресурс] http://www.sueddeutsche.de/politik/fakten-zur-europawahl-wo-kaum-einer-zur-wahl-ging-1.1975410 (дата обращения:15.07.2016). Aufbruch fur Thuringen. Wahlprogramm zur Landtagswahl 2014. S.3. [Электронный ресурс] http://afd-thueringen.de/wp-content/uploads/sites/2/2014/07/AfD_Thueringen_Wahlprogramm.pdf (дата обращения:28.07.2016). Landtagswahl 2014 in Thuringen – endgultiges Ergebnis[Электронный ресурс] http://www.wahlen.thueringen.de/datenbank/wahl1/wahl.asp?wahlart=LW&wJahr=2014&zeigeErg=Land (дата обращения:16.07.2016). Antisemitische Tendenzen:Zentralrat der Juden kritisiert AfD [Электронный ресурс] http://www.spiegel.de/politik/deutschland/afd-zentralrat-der-juden-fuerchtet-antisemitismus-a-994223.html(дата обращения:8.07.2016).